SEPTEMBER 30 saw the long-awaited return of rebuilt ‘Merchant Navy’ No. 35018 British India Line to main line passenger service. Freshly repainted in BR lined green, the Bulleid Pacific worked ‘The Lune Rivers Trust’ tour from Carnforth to York via Skipton. Unfortunately, the day did not go entirely to plan as the West Coast Railway Co locomotive was failed at York and Stanier ‘Jubilee’ No. 45699 Galatea stepped in to cover the return leg. No. 35018 remained at the National Railway Museum in York until October 12, when it worked light engine to Carnforth with ‘A4’ No. 60009 Union of South Africa. The ‘MN’ is expected to replace rebuilt ‘Scot’ No. 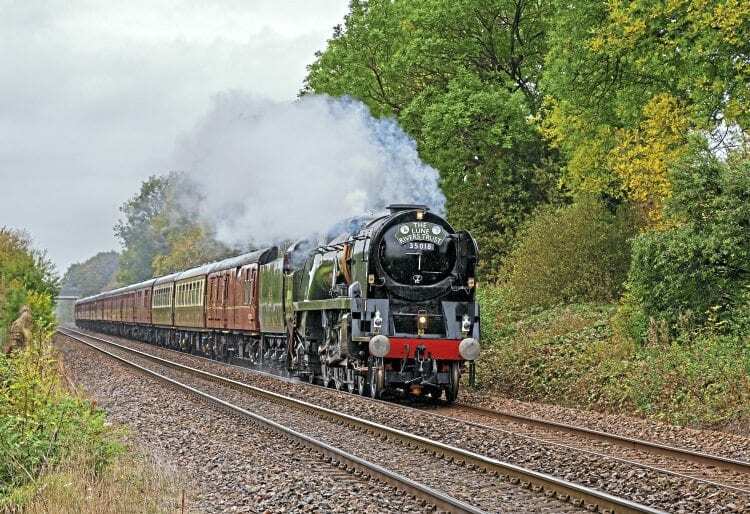 46115 Scots Guardsman in the WCRC main line steam pool, working alongside Galatea and No. 45690 Leander on a variety of tours.